Mochdre is a small village high up in the hills above Newtown and the Severn Valley. "Mochdre is a parish situated about 3 miles S.E. from Newtown, and is in its county court, union and postal district. The parish is of a very irregular and mountainous character. The church, re-built several years since, is a neat, but small building, dedicated to St. Asaph. Carding and fulling are carried on to a small extent. Population in 1861, 526; in 1871, 542". In 1813 Ann's gg grandmother, Martha Lewis, was baptised in the Parish Church of Mochdre (or Moughtrey), though clearly not in the building as it is today. Martha was actually born at Pentre and was the daughter of Edward and Maria Lewis. She was married twice, first to Richard Lewis and then to George Swain. As an adult she lived in Newtown. Image © Andy Andrews. Rescanned 2007. Information provided by and © Ann Andrews. 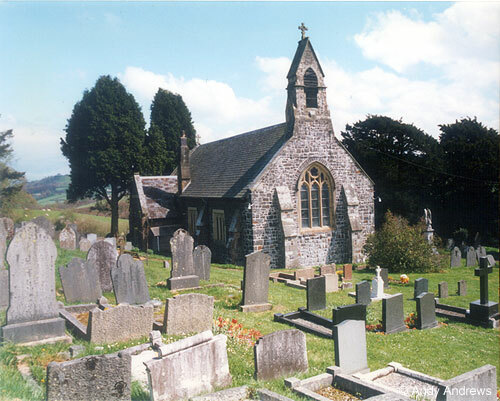 Montgomeryshire Genealogical Society and Powys FHS both have information about the parish. To locate their websites, please click on "links" in the page footer.